The minute you step through the door, you know how good it’s going to be. The smell of the fresh baked breads and pastries tease your sleepy taste buds and awakens your senses. I sampled four of the many varieties and types of breakfast goodness. The plain croissant was light, flaky, and buttery. It was one of the best croissant’s I’ve had in the city. The mixed berry muffin was moist, and packed with fresh berries, but I wasn’t going to stop there. The last two pastries were by far the best I’ve ever had. If you know me, you know how much I love Flour Bakery in Boston, but the Pineapple and coconut tart and the fruit bar were out of this world. Look closely at the picture, and you’ll almost be able to taste it. Light flaky layers of dough, surrounding rich, sweet caramelized pineapple and toasted coconut. 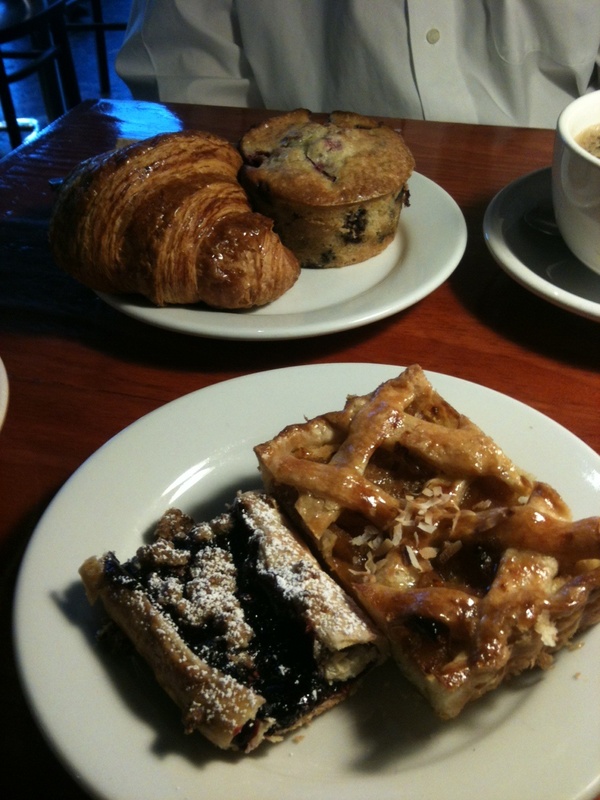 My only complaint about Thorough Bread and Pastry is the coffee. Though I know many of you will not agree with me, I found the coffee too dark and over roasted for my taste. The aftertaste was nearing bitterness. My suggestion the next time your in San Francisco and want some of the best pastries is to get the pastries to go and find yourself another place to get your coffee. With love from my bowl to yours…Happy eating!